Gujarat Divya Jivan Sangh, Valsad organized seven days Yoga, Pranamayam & Dhyana Shibir under the Guidance of Pujya Sri Swami Adhyatmanandaji Maharaj at famous Awabai High School in open ground. Evening discourses on the subject of “Sant Samagam” (company of Saints) at Wadia Hall attended by large numbers of devotees. Pujya Swamiji talked about the lives and teachings of many Saints including Saint Kabirdasji, Shri Narsinha Mehta, Sai Baba & Swami Sivanandaji. During his stay at Valsad, Rev. 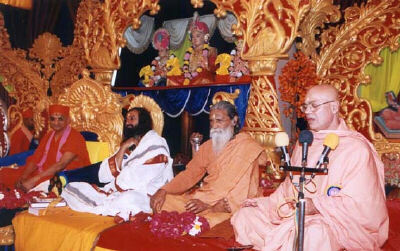 Swamiji was invited on the occasion of Silver Jubilee celebration of Sharda Vidyavihar. Teachers of the institute were honored on this occasion. Swamiji paid visit to ninety year old Shardaben, the founder of this organization. Also many devotees invited Pujya Swamiji to their homes for His Blessings. A Sadhana Shibir was organized at Param Praman Darshan Ashram situated at the bank of river Killa Pardi. Swamini Tanmayananda Mataji, Swami Nityanandaji Maharaj and other saints and trustees of the ashram honored & welcomed Rev. Swamiji. 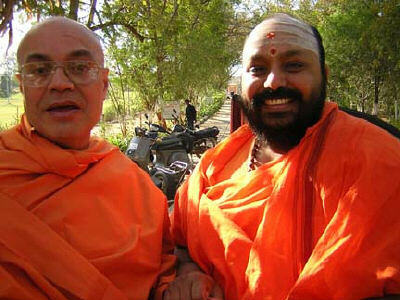 They requested Swamiji to conduct such shibir more frequently. This holy festival was celebrated with twenty five hours of continuous worship services in Sri Vishwanath Mahadev Mandir at the ashram, which began in Brahmmurat (auspicious early morning time) on Feb 18, at 4.00 am until Feb 19, 5.00 am . 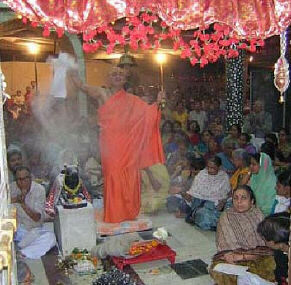 Rudri Paths, Rudrabhishek, Abhishekatmak Laghurudra Puja and 60 special Pujas were performed . Rev. Swamiji Maharaj performed Bhasma Aarati at 7.45 pm. and 12.00 midnight . Bhakti Sangeet (Devotional music) was provided by different musical groups and accomplished individual artists, including Radheshyam Satsang Pariwar” Aradhana Sangeet Academy, Smt. Monicaben Shah along with her 100 students, Smt. Seema Trivedi and Sri Jayesh Naik of Sugam Sangeet, Smt. Mayurikaben Oza, Shri Pandit Omkarnath Thakore, Sangeet Sabha of Bharuch and well-known violin player Sri Haribhai Kapdia from Bhavnagar. Devotees from Khedbrahma, Ramnagar, Kadiyadara, Karamsad, Navsari, Vadodara, Gopri, Bharuch, Surat, Valsad, Rajkot, Jamnagar, Surendranagar, Mumbai and London participated in the Shivratri festivity. About 80,000 devotees had darshan of Sri Vishwanath Mahadev on Shivaratri day. Sivanada Ashram feels very fortunate to have frequent visits and Satsang of many Mahatmas from other organizations at the Ashram. H. H. Sri Swami Subhodhanandaji Maharaj’s visit to Ashram : On Feb11, 2004 Head of Chinmaya Mission (North Zone), H. H. Sri Swami Subodhanandaji Maharaj visited the Sivananda Ashram and devotees had nice satsang with Him. Sri Sri Ravishankarji Maharaj’s Visit to the Ashram: On Feb 19, 2004 the founder of “Art of Living” organization visited our ashram. It was a joyous occasion for the inmates of the Ashram. Satsang with Sri Sri Ravishankarji Maharaj, founder of "Art of Living" organization at the Ashram. Sri Swami Harinayananandaji Maharaj, General secretary of Akhil Bharat Sadhu Samaj also visited the ashram. 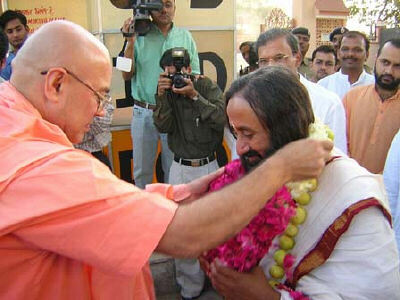 On Feb 21, 2004, Pujya Swamiji was in Lucknow. His Public discourse organized by Lucknow Medical Association was well received by the audience. Function was presided by Dr. S. C. Rai, M.S. Surgeon, and Mayor of Lucknow. Rev. 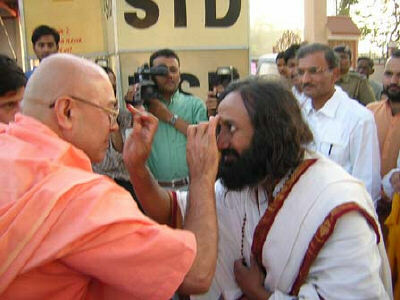 Swamiji was invited to inaugurate the Medical Clinic of Dr. Archana Srivastava. & Pediatric clinic of Dr. Manoj Singh. 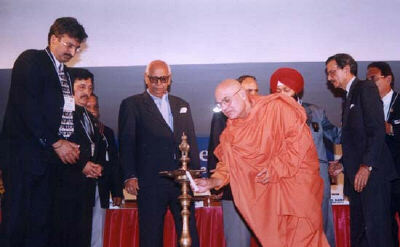 Swamiji Maharaj also laid the foundation stone of Cardiology clinic of Dr. Anil Srivastava. Pujya Swamiji addressed a gathering of Students of Jaipuria Institute of Management at Lucknow . Rev. Swamiji Maharaj presided over second day session of sant Sammelan held at Mahatma Gandhi Maidan for three days long function, where more than three lacks people had participated. He talked on Vedic Sanatan Dharma at All Religions Meeting and All India Radio, Patna, recorded the event. Ludhiana Management Association organized Pujya Swamiji’s talk on “Managing the Self, A key to Success". Highlights of His talk were released by local TV Channel and newspapers. In great work “Kumar Sambhavam” Kavi Kalidas has said that ‘dharma, artha, karma, mokshanam arogyam mula uttamam’. Means for any achievement of the individual life to have sound body and sound mind is the first essential need.. It is ‘Sine qua none’. Other than these positive attitudes and passionate belief nurtured by meaningful goals and motivation sustained by untiring perseverance and living compassion can achieve amazing success and abundant happiness for time eternal through life’s journey blessed by enlightened wisdom and almighty’s bounty. Victor Hugo said that ‘there is one thing stronger than all the armies in the world………. And that is an idea, whose time has come’. So to have correct and absolute idea one must have proper attitude for the self, which can lead later on for the cosmic aptitude. Because to manage the self, the longer you live, more you realize the impact of attitude in life. Because for managing self it is very essential and important than education, than money, than circumstances, than failures, than success, than whatever anyone might think, say or do. Attitude is more important than appearances, giftedness or skill. It can make or break a company, home or relationship. The remarkable thing is that we have the choice to create the attitude we have for that day. We cannot change our past, we cannot change the way people act, and we cannot change the inevitable. The one thing we can change is the one thing we have control over, and that is our attitude. I’m convinced that life is 10 percent what actually happens to us and 90 percent how we react to it, say’s Charles Swindoll.. Managing the self is not merely physical fitness or mental peacefulness. It is your total being, the vision that you glorify in your mind, the idea that you enthrone in your Heart………..this is what will build your life! This is what you will become! A man is literally what he thinks, his character being the complete sum of all his thoughts. Man becomes that of which he thinks! Says the Upanishads. And Buddha says “mind is everything……….what you think you become”. Meditations of Marcus Aurelius “your life is what your thoughts make it”. Writings of Confucius, Mohammed, Aristotle, Socrates and finally from Bible also we found “As he thinket in his heart, so is he”. Positive thinking is also essential need for managing the self. You can lament…….. because roses have thorn………..or you can rejoice…………because thorns have roses! To have the dynamics of goals are another need. Because no one can predict to what heights you can soar……even you will not realize it…….. Until you spread your wings! One should not forget that the heights by great men reached and kept…… were not attained by sudden flight, but they while their companion slept…..were toiling upwards in the night. So the secret of success why go into something ……just to test the water? Just go into it……..to make waves. Keep happiness and remember that no one can make you unhappy ……..without your consent. 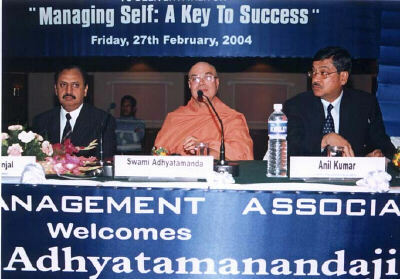 On Feb 28, 2004 Swamiji Maharaj presided over and gave a keynote address at Zonal conference of Rotary Club. Rev. Swamiji also had darshan of Golden Temple early morning at 3.30 am. On Feb 15, 2004 free Medical Check-ups and Blood Donation Drive were organized by Navyug Hitwardhak Mandal of Navyug Colony, Ahmedabad. Rev. 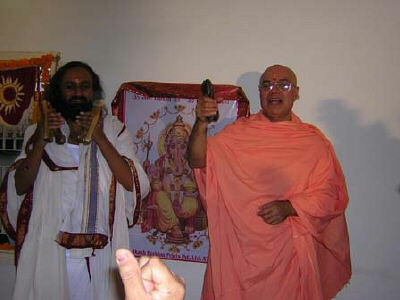 Swamiji Maharaj was invited to inaugurate this occasion. In his speech on this occasion, He talked about importance of selfless service to known and unknown for spiritual growth. One can achieve God Realization through karma Yoga. On Feb 17, 2003 eminent dance academy of Ahmebabad “Nritya Bharati “organized “Aje Ke Kalakar” dance performance to encourage budding young artists at Tagore Hall. Rev. 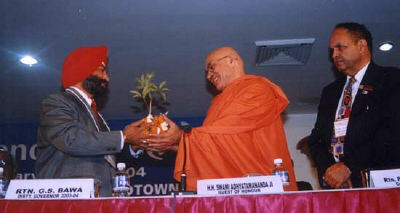 Swamiji was invited as the Chief Guest. He lighted the lamp and honored all the artists. On Feb 18, 2004 , Brahma Kumaris Ishwariya Vishwa Vidhyalaya Center Celebrated Birthday of Dada Lekhraj Maharaj, a founder of the organization in holy presence of Pujya Swamiji Maharaj. He delivered a Discourse on the subject of “Compassion and Cooperation” on this occasion. 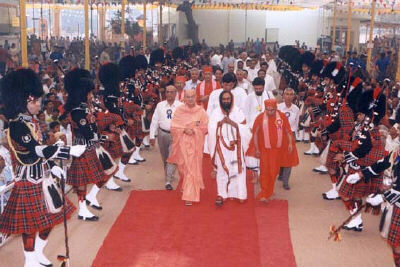 On Feb 15, 2004, Vanprastha Ashram, Maninagar inaugurated the addition of two new floors on their existing facility. Pujya Swamiji was invited to the inauguration function. Union Minister of Home Affairs, Central Government Shri Harinbhai Pathak was the Chief Guest. This Vanprastha Ashram accommodates the needy elderly with minimal charge of Rs. 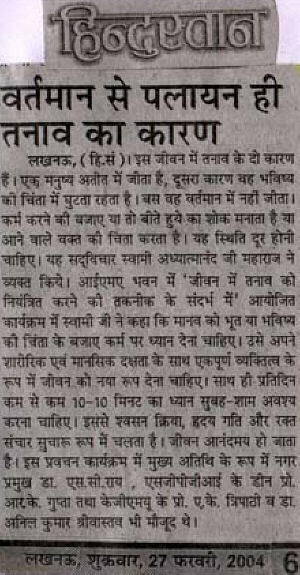 600/ month and also provide medical care at “Ashkta Ashram” in Dakor. Rev. Swamiji praised selfless and devoted service by staff to the unfortunate elderly in need whose children are not caring for their own. 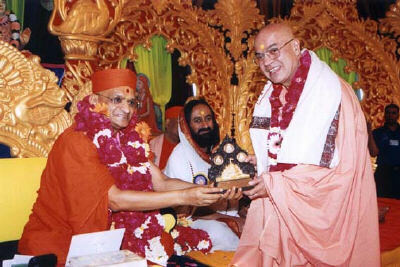 Along with Union Minister Shri Harinbhai Pathak, Swamiji Maharaj visited Dakor, Umreth and Nadiad on the Feb 16, 2004. The School run by Shri Ranchodrai Education Society at Dakor celebrated its award ceremony in Holy presence of Pujya Swamiji. The bright students of Sanskrit were felicitated by giving cash awards. Rev. 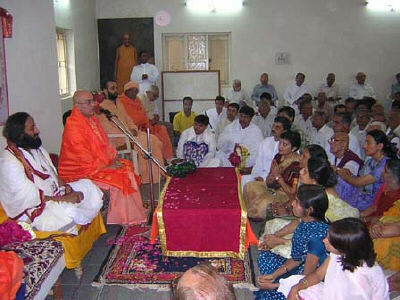 Swami Adhyatmanandaji Maharaj, Sri Ravishankarji and Sri Swami Harinarayananandaji Maharaj attended felicitation function organized for Gadi Pati Sri Swami Purshottampriyadasji organized at Swaminarayan Mandir, Maninagar by Swami Muktajivan Swaminarayan Gadi Sanstahan. Union state Minister of Home Affairs Shri Harinbhai Pathak graced the function as Chief Guest. Rev. Swamiji visited Harihar Ashram, Ellisbridge on Shivaratri day and also met Mahamandleshwar 1008 Sri Geetabhartiji who is the president of the ashram. Rev. 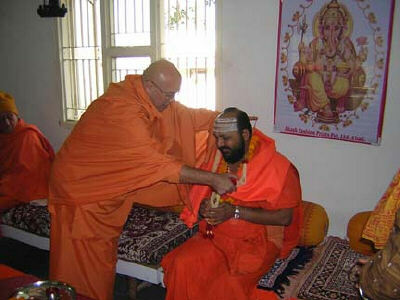 Swamiji also took part in Maha Pooja held at Jagdish Mandir on Shivaratri day.